Have you ever felt that nagging pull that you need to be perfect at keeping up with your home and raising a family? Like you should have the most fun day ever with your kids every single day, and still have a clean and organized house, a fully stocked pantry and fridge, and a gourmet meal ready when your husband gets home from work? Like you should have a huge group of best friends that you talk to all of the time, have playdates with every week, and your kid is the most well behaved of them all? Yea, I feel those pressures too. But you know what? That's not what my life looks like at all. We live in a world of "Pinterest perfect" pictures of houses, 60 second videos of "easy" meals, and a constant stream of photos of our friends having fun. With all of those things in front of us all of the time, it's impossible not to feel like we should be able to manage it all! I might be a blogger who has pins all over Pinterest and a few pretty pictures on Instagram, but I promise you, my life is only "Pinterest perfect" for the amount of time it takes to snap that photo. The rest of the time, real life is happening. In this season of my life, there are toys everywhere, there are multiple baskets of laundry that haven't been put away yet, there are dishes in the sink, and my husband is lucky if I have even thought about what's for dinner tonight. With a toddler and baby, the idea of getting out of the house for a play date or even to the grocery store is overwhelming sometimes. Between juggling naptime and dirty diapers for two kiddos, the days are flying by. But the days are also long because I feel like I'm not keeping up with the every day life stuff I'm supposed to be doing. I don't have any desire to be perfect. What I do want is for my family to be happy, my home to be tidy-ish, our bellies to be full, and to have time for self care (which for me means taking time to be creative. What relaxes you the most?) Instead of letting all of the responsibilities completely drown me, I've been searching these last few months for ways to make it all more manageable and to accomplish my priorities. Everything in life is a season, and during this time, my priorities are different than they may be a year or two from now. My focus will change over time. But for right now, here are some of the things that are making life a little more manageable or just making me feel like I'm not crazy or alone when I feel overwhelmed. 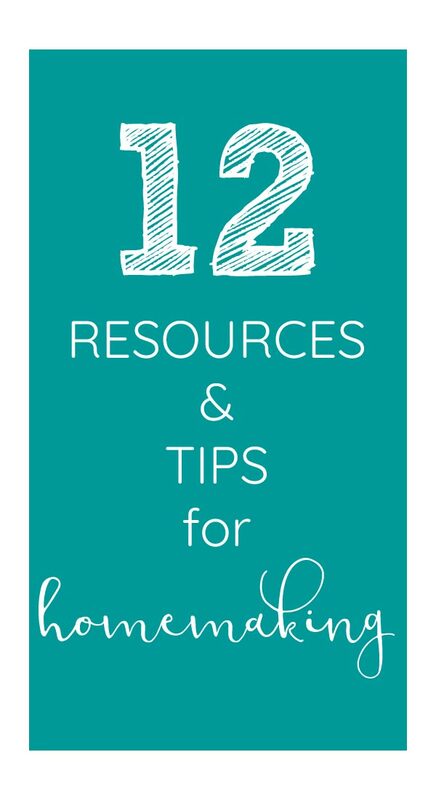 If you ever feel the pressures to be perfect in your homemaking or in raising your family, I think you will enjoy some of these resources. The Homemaking Foundations Podcast- This is hands down my favorite podcast right now. Jami is the mother of five kids under the age of four, and she offers a completely honest look at what life is really like, but she also shares tons of useful tips for all aspects of homemaking. Hearing how she can manage so much with such grace and joy makes me feel like I can accomplish anything. She is so encouraging and reminds us why we do what we do as homemakers, mothers, and wives. Facebook groups- There are so many supportive Facebook groups out there these days. There is something for everyone! Right now I am loving this group for parents with two under two and this group for Christian homemakers. Both are full of tips from other parents and homemakers on how they keep up with daily responsibilities with children. Planner- A good planner is a must. I'm totally a pen and paper kind of person. I can't keep up with organizing my life on my phone. This year I'm trying The Happy Planner by Create365 and am loving how much space it has to write! You can also find plenty of customizable and printable options here. 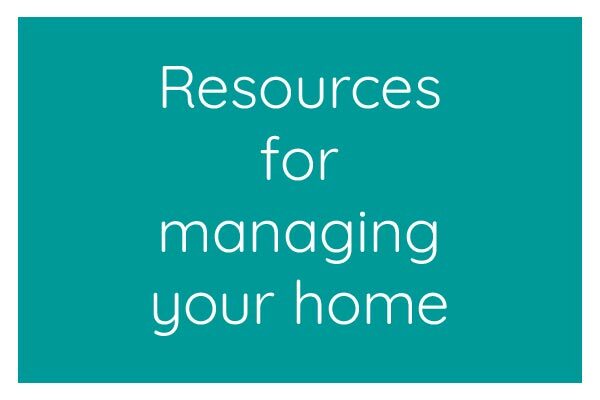 Home Management Binder- I love printing off checklists and charts to keep me on track. 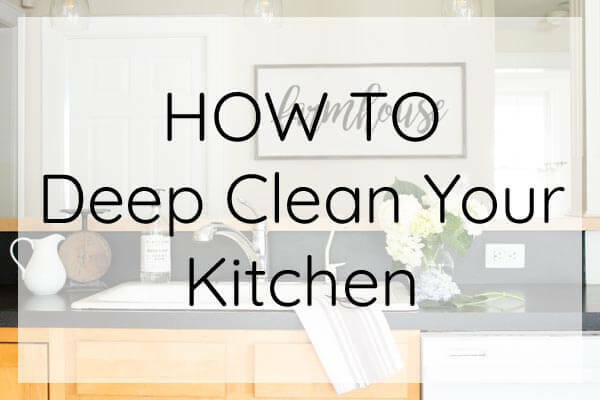 Having everything in one place makes it so much easier to keep on top of housekeeping and important homeownership things that are easily forgotten. I've been searching for the perfect home management binder and have found lots of great Etsy printables. When I find one I absolutely love, I will let you know! Parenting bundle- Got kids? Whether you're feeling a little overwhelmed adjusting to parenthood or are looking for kids crafts or homeschooling tips, this bundle of e-books and courses can help you. It's got me covered right now on picky eating, potty training, and discipline, plus how to nurture creativity in my kids. See if it has anything that meets your parenting needs. 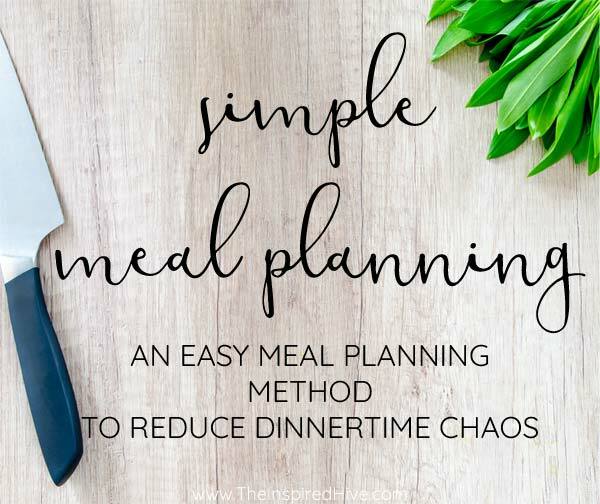 Meal planning- This is one thing I've been really working hard on so that there are no more evenings rushing to pull something together and then hardly having any family time between when my husband gets home and when the kids go to bed. Being prepared makes things so much smoother. Even a simple magnetic notepad meal planner is helpful. This is also a GREAT list of tips and resources for beginner meal planners. You can read about my simple meal planning method here. Grocery delivery- With two kids under two, getting to the grocery store is tough. I've looked into grocery delivery or pick up, but unfortunately we live in a rural area that doesn't have these services available. However, if your area offers grocery delivery and you are in a life stage where you just can't get to the store easily, why not sign up for a short time? Reevaluate every six months or so to see if its still something worth paying for. E-meals offers meal planning and then sends your grocery list to your grocery delivery service for you. Peapod, AmazonFresh , Safeway, and Thrive Market are all highly rated. Try a service like Boxed for items you want to store in bulk. Or consider a service like Hello Fresh that delivers planned meals ready for you to prep and cook. Printable To Do List- Last year I created my own printable weekly to do list to help break down my priorities and tasks for the week. It helps me see my tasks at a glance. Get your free download here, and then print out a copy at the beginning of every week to help plan out your week. Homemaking Bundle- This bundle is full of helpful tools and tips for homemakers. It contains printables, e-books, and courses on meal planning, organizing, cleaning, parenting, marriage, self care, and more. It typically launches in the spring, and I purchase it every year! I always learn so much and find so much encouragement. It's given me the most insight so far on budgeting, meal planning, cleaning, and building routines. It also contains some fun stuff like home decor and hosting guests. For 30 bucks, you can't beat the endless options for helping you manage your home. You can check out this year's bundle here. Make Over Your Mornings- I haven't actually taken this course yet, but I have heard SO many great things about it! It's at the top of my to do list after I finish the bundle I mentioned above (PS- I love listening to e-courses and podcasts while I'm cleaning!! Why not nurture your mind while you work?). This course is about creating a morning routine to set the stage for the rest of your day. We soooo need this in our household right now!! Say Goodbye To Survival Mode- Survival mode is exactly what we're going through over here right now. Do me a favor, go read the description of this book on Amazon. If it resonates with you at all, you will love it!!! Get rid of stress and start living more intentionally. I would love to hear what has helped you in your homemaking. Whether it's a quick tip or a great resource, let me know! Leave a comment or send me an email! Get access to the homemaking bundle here.